The rage of the Left has gotten most of the attention, of late, as they are loud and control the mass media. Their endless tantrums about losing the 2016 election, as well as their increasingly shrill anti-white rhetoric, is flooding the zone. Lost in all of this is the collapse of neoconservatives into a squalor of vulgarity, dishonesty and paranoia. Whatever it was, the political movement of Norman Podhoretz and Irving Kristol is now just a collection of bigoted rage-heads. This Noah Rothman column is a good example. The word “ethics” appears prominently in the biographies of the authors who co-wrote a recent Washington Post op-ed lamenting the “taboo” associated with “talking about overpopulation.” Frances Kissling is the president of the Center for Health, Ethics, and Social Policy. Peter Singer is a professor of bioethics at Princeton University. Only Jotham Musinguzi, the “director general of Uganda’s National Population Council,” doesn’t mention “ethics” in the bio. That’s good because the Malthusian views promulgated in the piece are anything but ethical. Because population control is not a problem in the developed world, where birthrates are declining below even replacement rates, population controllers tend to fixate on sexual habits in the developing world. The authors of this op-ed are no exception. They draw an almost always fallacious straight-line projection to conclude that—in the unlikely event that nothing changes between today and 2100—a population crisis should afflict a variety of Sub-Saharan African nations. To avert this crisis, they advocate promoting and supporting proper sexual hygiene, to which almost no one would object. But their authors’ core agenda isn’t the distribution of prophylactics. They seek to de-stigmatize abortion in the equatorial world, which is controversial for reasons that have nothing to do with faith. After all, it was The Population Bomb and its progenitors that lent renewed legitimacy to old arguments that inevitably result in targeting black and brown populations with sterilization and eugenics. This is the default approach for Rothman and most of the neocon tribe. Instead of simply disagreeing with someone, they first paint the person as immoral, beyond the pale and therefore fair game for whatever accusation they can conjure. Before offering any evidence, Rothman strongly implies the authors of the Washington Post article are unethical people. He never backs this up with evidence. Instead, the fact that he does not like or understand their argument is enough for him to slime the authors of the piece. If you read the WaPo article, you’ll see that it is a good faith effort to talk about the population explosion in Africa. They blame Paul Ehrlich for discrediting the topic of population growth, because they are forbidden to discuss the real issue. To talk about the world’s most important graph, is to risk being called a racist by slime merchants like Noah Rothman, so they dance around it. The piece is actually fair and reasonable, given that it appears in a hysterical propaganda outlet like the Washington Post. Now, Rothman is a stupid person, so it is no surprise that he is wildly ignorant of Malthus and population issues. Stupid may be the wrong word. Ignorant is a better word, as he makes to no effort to know about these things. He’s too busy claiming everyone who disagrees with him is immoral. His game is to attack and then cry out in pain when the other side mounts a defense. His likes to paint himself as the moral actor, forced to do horrible things to those who he decides are beyond the pale. He is also a serial liar. He smears people all the time and then lies to their face about what he wrote. This classic Tucker Carlson segment is a great example. Rothman lies in his column about something Carlson said. When confronted with it, he then lies about what he wrote. When his own words are read back to him, he changes the subject, only to start lying about what the Secretary of Defense said. When confronted on that, he starts lying about other stuff. The takeaway is that Noah Rothman is incapable to telling the truth. As I’ve pointed out in the past, whatever it was, neoconservatism is now just an ethnocentric death cult. It is a strange blend of Zionism and anti-majoritarianism, that lacks an intellectual core. The list of neocon thinkers is not exactly a glittering array of heavy weight intellectuals. Rothman is a smarmy twerp. John Podhoretz is a vulgarian. Max Boot appears to be struggling with mental illness. Bill Kristol is a bitter old fool. Jonah Goldberg is a frumpy dufus. It’s like a Jewish version of the Kennedy family, minus the homicides. That gets to the heart of it. The Jewish century was powered by a generation of Jewish men who were smart, educated and embraced by a majority ruling class that had built the foundation of the American empire. Not only could neoconservatism only happen in America, it could only happen in the Cold War world of American politics. Today’s America is a different place and today’s neocons are a collection of feckless heirs, playing make believe as they squander their inheritance. The term of art is reversion to the mean. Just like the reckless kid with a trust fund, the neocons have caused a lot of damage and continue to be a menace. Their efforts to undermine Trump’s Korea initiative and their efforts to entangle us in the Syrian civil war are two obvious examples. The fact that the New York Times and Washington Post are festooned with these loons, means they will pollute public discourse for a while longer. The good news is that guys like Noah Rothman are the future of the movement, which means it has no future. I’m back to the shotgun format for this week. The single issue format got a lot of good feedback, so I think I’ll do more of those. I have to think of some topics first, to make sure it is sustainable, but I’m confident that will not be a problem. Last week was one of the most downloaded issues I’ve done. Anything that has race in it gets a lot of traffic. That says a lot about the audience, but it says a lot of about our age too. Race is real. For this episode, I’m back to a cornucopia of unrelated items I saw this week. I thought about doing a show around the upcoming libertarian convention, but I think an hour of sperg-bashing would be gratuitous, so I have just one segment on it. If there is a common thread to this week’s show, it is that the gap between Left and Right is growing. It really does feel like the public is coming to the realization that it is time for a divorce. This week I have the usual variety of items in the now standard format. Spreaker has the full show. I am up on Google Play now, so the Android commies can take me along when out disrespecting the country. I am on iTunes, which means the Apple Nazis can listen to me on their Hitler phones. The anarchists can catch me on iHeart Radio. YouTube also has the full podcast. Of course, there is a download link below. I don’t have a cable subscription, so the habit of channel surfing is unavailable to me, which means I miss much of what passes for pop culture. If I watch a movie, it is off the pirate system or from Amazon. TV shows I can binge watch off the Kodi, without having to sit through the commercials. Frankly, it is the only way I can watch television now. The commercials are so full of multicultural proselytizing, that I can’t make it through a normal show. That said, there are some shows that are not full of multiculti agit-prop. Someone told me the TV series 12 Monkeys was pretty good, so I binged the first couple seasons recently. The series is based on the movie, which was a time travel flick staring Bruce Willis. The basic premise is people in the future send people back in time in an effort to find the people who caused a great plague. The idea is to alter the timeline by preventing the plague or figuring out the nature of the plague in order to create a treatment or vaccination against it. In the movie, Bruce Willis was the time traveler. The trouble with all time travel movies is that they can never figure out how to handle the obvious problem of paradoxes. The writers usually fixate on it, as it makes for interesting possibilities, but they lack the smarts to make it work. Sometimes you have old self going back in time to give young self answers, like what happened with Biff in the Back to the Future series. Other times, the old self accidentally alters something in the past, only to return to a wildly altered future, his present. Then he has to go back and fix what he broke. In this series, the writers actually do a good job avoiding the hackneyed time travel plot gimmicks and come up with a good plot that respects the “reality” of time travel. I don’t want to give too much away, but it you read the book The Man Who Folded Himself you will appreciate what the writers did with time travel. The show is relatively free of poz. No heroic homosexuals, no super hero women, no magical negros. It’s mostly unknown white actors doing a serviceable job acting out a reasonably well done television script. Now, no series about time travel can make it to the air without having some scenes about the characters going back in time to Nazi Germany. That’s an unknown part of the secret law that was passed in the 60’s. We get that nonsense in this series, but it is brief, even though they obliquely try to blame the cause of the time travel conspiracy on the Nazi scientists experimenting on Jews. It’s the one bit of subversion that was tucked into the script after it was written, on instructions from the people producing the series. The relative lack of poz in the series got me thinking about propaganda in movies and when it became so heavy handed. I had the movie Death Wish on my list, the new version, not the 1970’s version, so I watched it along with the original last weekend. I had not watched the original with Charles Bronson is decades. Frankly, I had forgotten just how bad he was at acting. Then again, the 1970’s featured a lot of really bad acting in popular movies. Maybe the audience just liked the stilted dialogue and clunky style. For those unfamiliar, the original Death Wish was made during the last Progressive inspired black crime wave, which they started in the late sixties. By the 70’s, most cities were unlivable because feral blacks were running wild in the streets. Death Wish is about a normal middle-class white guy who loses his family to home invaders and decides to become a vigilante. The original makes the killers three Jewish guys, one of whom is Jeff Goldbloom, so even in the 70’s, movies were poz’d up on the race issue. That said, the woman issue is where you see the difference. In the opening to the original, Bronson is at the beach with his wife, who is portrayed as a normal traditional wife. She likes looking like a women and being complimented on her looks. Bronson’s character enjoys her being a women and acts like a normal man. Throughout the movie, women play normal female roles. Whenever I watch an old movie and see how women were cast in their roles, I realize what a great mistake it was giving into the feminist harpies. The new version does the same thing with the race issue, of course. We’ve reached the point now where it is forbidden to portray blacks as anything other than noble victims or admirable heroes. That means we have to pretend the nation’s crime problems are the fault of white street gangs using out-dated slang from the olden thymes or conspiracies operated by evil white men. Otherwise, the remake is a decent version that is free of the usual multicultural junk that makes most movie watching miserable. I’ve developed an interest in 1970’s pop culture, mostly because it seems so alien to me, even though I was alive to remember some of it. I was too young to notice most of it, so seeing it through old man eyes in the current age, it feels like another world. But, it also reveals that the multicultural assault on our society did not start last week. This is a long term, multi-generational war on us that started before most of us were born. This scene from the 1971 Dirty Harry movie is a warning from the long gone past. There are a lot of ways to describe the new political divide that has emerged over the last decade. We have nationalists versus internationalists, globalists versus populists and identitarians versus the multiculturalists. All of those are true, but another way of thinking about it is that the debate is now moving upstream. For a long time, public debate was focused on economics or maybe politics. Those are downstream from institutions, culture and biology. Now, the debate has moved upstream, to the the stuff that really matters. Not everyone has figured out that the debate has changed. The Bernie Bros, for example, are like the Japanese soldiers, who were cut off in the war and lived in the jungle for years, still fighting the war. The Bernie Bros still think the Democrats are the party of the working man, as if anyone in Washington cares about the working man. The legacy conservatives are similarly trapped in a bygone era. You see that in this post, by our old friend Sloppy Williamson, on the ravages of socialism on Venezuela. he United States has resigned in protest from the UN Human Rights Council, which has a long and ignominious record of protecting the world’s worst abusers of human rights. The proximate cause of the U.S. resignation was the council’s unwillingness to act on the matter of Venezuela, where the socialist government of Nicolas Maduro is engaged in political massacres and the use of Soviet-style hunger-terror against its political enemies. Venezuela remains, incredibly enough, not only protected by the Human Rights Council but an active member of it, an honor shared Vladimir Putin’s Russia and its political assassins, the People’s Republic of China and its organ harvesters, and the Castro dictatorship in Cuba with its torturers and al paredón justice. For generations, it has been an article of faith, among conservatives, that everything depends upon economics. It’s not just that if you get the economics right, then the miracle of the marketplace will usher in the the age of bliss. It’s that their preferred economic models are intrinsically moral. That means the wrong economics must always result in terrible outcomes. Bad tax policy not only makes people poor, it makes them corrupt, violent and cheat on their wives. Like Marxists, they think the system makes the man. Well, what about Venezuela? What’s really going on? 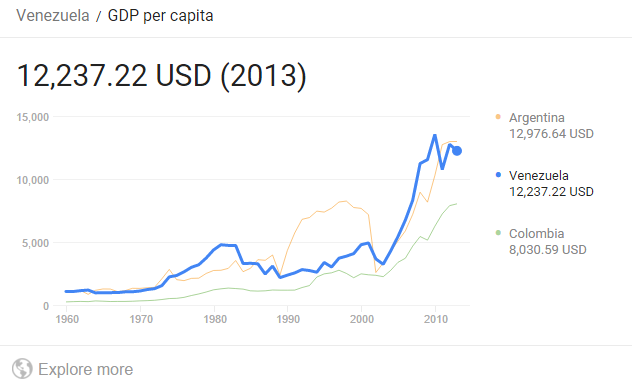 Here’s the per capita GDP. Now, wages and economic growth don’t tell the whole story. Venezuela suffers from the curse of natural resources, which in her case is oil. What dumb people call socialism is really just the way things have always operated in countries with low levels of human capital. The elites monopolize the natural resources and the profits that come from selling them on the international market. They spread enough money around to prevent a revolt, but otherwise it a system not all that different from what existed in colonial times. In other words, what ails Venezuela is not ideology. It is biology. It is the way it is because of its people. What determines the nature and character of a country is not the tax code or the regulatory regime. The nature of a country comes from the people. Venezuela lacks the human capital to operate a modern economy. It has and always will suffer from the smart fraction problem. That is, it lacks a large enough smart population to carry the rest of the population into a modern economy. It remains stuck in a model suited for its people. Put another way, it is people, not pots. Replace the Venezuelan population with Finns and they will figure out how to make a mild form of Nordic socialism work just fine. Fill the place up with Japaneses and the country will look like an Asian tiger. At the same time, begin to fill up the United States with Latin Americans and it is going to start to look like Latin America. That’s why your newly imported replacements are running on platforms familiar to anyone getting ready to vote in the upcoming Mexican elections. Of course, the reason that raging cucks like Sloppy Williamson avoid the obvious is that it is much safer to focus on trivialities. Lefty mobs are not going to swarm his Rascal scooter if he avoids taboo subjects. That and these guys have been playing the role of useful idiot for so long, they are unable to notice that the world has changed. They operate like a cargo cult, convinced they can pretend it remains the 1980’s and it will magically be so. National Review is like a weird living museum to the Reagan era. The world has changed, though, and the debate has shifted upstream. People are noticing that when you elect a new people, you don’t actually end up with a new people. You end up with a culture that reflects the biology of the people you imported. Whites in America are now coming to terms with the choices in front of them. Keep their head down and play make believe while they are replaced, or risk moral condemnation for defending their heritage and their culture. It’s a future with you or without you. That’s the debate. From the 1930’s through the 1970’s, the American Left completely controlled the political agenda. They pushed through Civil Right, the creation of the welfare state, the parameters of economic policy and foreign policy. The Left defined the terms and the parameters of the political debate. Then, Reagan won in 1980 and the Left suddenly looked like an old fighter, long past his prime. They could not control the agenda and they had no one in leadership that did not look ridiculous. It really did seem like they were a spent force. That was the main reason Bush the Elder was able to win in 1988. The Democrats put up Mike Dukakis, who may have been the most ridiculous presidential candidate in American history. In the 12 years the Republicans held the White House, the Left tried to rebuild itself to be relevant in the post-Cold War era, but ultimately the only thing they learned from the Reagan years was that they needed a better media strategy. The lesson they learned from the 1980’s was the Reagan was really good using television to win over voters. That was the funny part of the Clinton years. He won in 1992, mostly because Bush could not think of a reason why anyone should vote for him. Clinton played the Boomer card and they hired Hollywood professionals to run their marketing efforts. In fact, that was pretty much what the new and improved Left was in the 1990’s, a better media strategy. It was not just the highly stylized ads, but the way they choreographed their events and how they spun the media. The idea of a spin room was an invention of team Clinton. The Left seemed to revive itself in the Bush years, first over the results of the election in Florida and then over the wars. For the first time in a generation or more, the Left had a cause and it had energy. It was not enough win them the election in 2004, but they did get the House in 2006 and they put Obama in the White House. Then it was a repeat of the Clinton years, in that the Left had nothing to offer, which resulted in their annihilation in the 2010 election. The Obama presidency was not all that different from the Bush presidency. Another way of thinking about the forty years of American politics is that the post-war Left ran out of gas in the 1970’s and was knocked out by the Conservative Movement in the 1980’s. Like an old fighter, they staggered on for a while, but their time was over. Then the Right lost their punch in the disastrous Bush years, much like how the Left destroyed itself in the 1970’s. That makes the Obama years an interregnum, a period between the death of the old political dynamic and the next phase, which is what’s shaping up now. The fact that Trump won the nomination is proof that the conservative movement is a spent force. Add in the fact that swamp creatures like McCain and Kristol were part of the dirty tricks effort and Conservative Inc’s impotence is even more clear. On that score, the Left is looking even more useless. They had the FBI, DOJ and foreign intelligence agencies working for them and they were not able to beat Trump. They have not even been able to muster a decent resistance to what Trump is doing as President. This is a bit of a meandering post, but what got me thinking about all of this is this story about a Democrat candidate in West Virginia. The Left is hoping this guy has the secret answer for how to win elections in the Trump era. They are working from the theory that it was Trump’s earthy style that won him the election, rather than his position on trade and immigration. Instead of coming up with a plausible set of alternatives to what Trump is doing, they are hoping a better marketing strategy will magically solve their problems. The coordinated PR campaign about the children at the border is another example of the establishment making lots of noise, but offering no substance. They get everyone’s attention about the alleged crisis at the border, but then they have absolutely nothing to offer as a remedy. It’s as if the establishment is a cargo cult, where they think if they stand around on TV flapping their arms the right way, the world will magically return to the way it was before 2016. Both sides remain paralyzed by the lack of a reason to exist. Maybe that is the way to think about the last forty years of politics. The neo-liberal order, the grand project of our ruling class since the waning days of the Cold War, was a creation that never had a purpose. Once the new world order was in place, inertia carried it along, but for no real reason. Once resistance built up against it, the champions could not come up with a answer for why it should continue, other than to chant “our democracy and values.” It’s why they have no answers for the challenge of national populism. For the longest time, the argument against the Progressive project, which in America means multiculturalism as a civic religion, is that the various tribes in the coalition of the ascendant would turn on one another. The laws used to punish white people for being competent society builders would be used by the new tribes against the coalition and the whole thing would collapse. Then there was the point that the people leading the coalition are the most tribal people on earth. This is now playing out in the lawsuit against Harvard. Harvard is not about education. It is about the credentials. When you major in math at Harvard, or any elite college, you are not learning a different math from the math majors at UMass/Boston. Look through the course catalog of an elite college and it is noticeably less rigorous than most state universities. Entrance to an elite university is both a proxy IQ test and social proof. If you get accepted to Harvard, you are smart enough to be in the elite and you have the correct combination of innate virtues to be in the ruling elite. What’s playing out in this Harvard lawsuit is that the dominant tribe in the coalition is fighting to defend its position against this insurgent tribe, that has figured out how to game the admissions system. In order to prevent Harvard from becoming 50% Asian, they have rigged the system to prevent that from happening. The trouble, of course, is this is just the same sort of discrimination that Jews argued against last century. Instead of WASP’s blocking Jews from admission, it is Jews blocking Asians on cultural grounds. It’s important to remember that this is not about access to an education. Exactly no one thinks you learn more at Harvard than at UCLA or the University of Virginia. In fact, land grant universities, like Michigan or Wisconsin, offer vastly better education facilitates than the Ivy League colleges. What Harvard has is a credential that opens the doors to the nation’s ruling elite. At Harvard, you are with the future rulers of this land and that’s not something the current ruling tribe is interested in sharing with the newcomers. The most probable outcome of this is the court eventually sides with Harvard, by fashioning some ludicrous exception to the laws that govern everyone else. After all, the current Supreme Court is made up of six Harvard grads and three Yale grads. Look down the roster of the Federal bench and you won’t see many guys name Wong who graduated from Cal State Fullerton. The whole point of seizing power is to use it to reward your friends and punish your enemies. The people in charge have always known this. Now, this is amusing from the perspective of the Dissident Right, but it is also useful, in that it proves an essential point. That is, individualism is a sure way to get trampled by a motivated identity group. The people on top of the Progressive coalition got there by sticking together and working for their common good. The people suing them over admissions practices are doing so as a group. In the world of Progressive politics, group identity is the top level domain, it trumps everything else in the fight for position. The same thing is happening to America as we slide into majority-minority status. As of 2011, America was 60% non-Hispanic white. A majority of school aged children are non-white. Given the endless flood of migrants into the country, the die is cast. Within the next generation, whites in America will be a minority. Given the level of nastiness we see towards whites all over the popular culture, while whites remain a majority, imagine how aggressive and violent our new overlords will be when we are a clear minority. This proves the other point about the multicultural creed being imposed on us by our rulers. It inevitably must lead to lawlessness and group identity politics. Lee Kuan Yew was right, “In multiracial societies, you don’t vote in accordance with your economic interests and social interests, you vote in accordance with race and religion.” That is the lesson of history. Look at majority-minority places around the world, or even cities in America with large minority populations. Everyone puts their tribe above all else. For whites in America this will be tough to accept. For generations now, white people have been bathed in the poaching liquid of individualism. Subversives like Ben Shapiro still preach this stuff, even while he sports a yarmulke and fingers his two passports. The frontier mentality has become a part of the romantic mythology of an America most white people cling to like a life raft. Libertarianism is really just a weird romanticism for a past that never existed and future that has been foreclosed by multiculturalism. This will change as reality becomes more clear. The general lawlessness we see among our ruling classes is not unnoticed. When white people enter “white couple” in a google image search and it returns all race mixers, a white identitarian is born. This battle between our would-be over-class and our current over-class is the sort of thing that opens the eyes of white people about the reality of America. Those notions about individualism and a frontier culture are giving way to a sense that it is time to defend our own. I will be on the Happy Homelands show hosted by RamZPaul and Tiina Wiik. The other guest will be Junes Lokka, a Finnish activist. The show will be in English, not Finnish, in case you were wondering. The show is a censor-friendly operation, which means the language and topics are what you would find on television. The format is current events, with an emphasis on topics related to nationalism and populism. You can post questions in the chat window. It is a one hour show and it is archived for later viewing. This week I thought I’d try something different and do an entire podcast on just one issue, rather than pulling segments together from stuff that caught my eye during the week. The reason is mostly variety, but I’ve also been seeing the phrase “Dissident Right” turn up around the internet. Before some millennial tries to define the term into some bespoke sissy philosophy, I wanted to put some markers down about what the term means. I’m not sure if this will be a regular thing. If I get a good response, then maybe I’ll do other podcasts on single topics like this. If people hate it, then I’ll forget the whole thing and pretend it never happened. The goal here was to put together something that people could think about, but also send to their confused normie friends and family to help them make the journey to our side of the great divide. I’ll be doing some posts on the topic as well. I have one special announcement this week. Tomorrow I will be on the Happy Homelands podcast hosted by RamZPaul and Tiina Wiik. It is a censor friendly live show about the news items of the day. Someone named Junes Lokka will also be on the show. He is a Finnish activist. You can post questions in the YouTube chat window and maybe someone will answer them. This is my first live show, so we;ll see how it goes.